BEAUTIFUL HOME! solid home built in 1948 and has been completely remodeled from 2009 to current. main floor offers living room, dining room, eat in kitchen with granite countertop, bedroom and full bath, 2 decks. Second floor 3 bedrooms and full bath. Lower level, laundry room, family room, 1/2 bath walk out to 4 car sized garage and walk out to patio. Many extras. Must see! 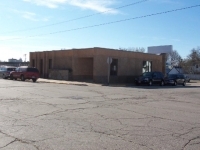 <p> Commercial building currently being used for church group; Large open room can be used for many other functions and 3 private offices.Building is located on the corner of S. Rock Ave. & Court St., Viroqua, WI. It is close to downtown and private parking lot.